A would-be king of England has visited the castle that might have been his seat of power. Michael Abney-Hastings, 62, a fork-lift truck driver from Australia, is a descendant of Edward IV's brother, George, Duke of Clarence. According to one historian, Edward IV was illegitimate and the crown should have passed to his brother's line. 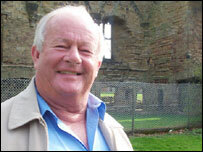 On Tuesday, Mr Abney-Hastings visited Ashby Castle in Leicestershire - which is owned by his sisters. He said: "I don't know a lot about the castle - all I know is it was used in Oliver Cromwell's day. "But we were on the wrong side, and so he blew it up for us. "Then over the years it's become even more dilapidated, and finally it was leased to British Heritage and it's open to the public now. "It really is a magnificent building - there is a walled-in chapel in the castle. "A lot of our relatives are buried in the vault there. "In fact, they had the vault opened some months ago just after mum's funeral." Historian Dr Michael Jones says Mr Abney-Hasting's claim is based on the illegitimacy of King Edward IV. He says Edward IV, who reigned from 1461 to 1483, was conceived when his parents were 160 kilometres apart. Dr Jones said Edward IV's alleged illegitimacy means the crown should instead have been passed down the Plantagenet line - ending at Mr Abney-Hastings. Mr Abney-Hasting says if the course of history been different, he would have ruled England from Ashby Castle as King Michael I. But does the English royal family know of the possible contender to the throne? "I was talking to a lady from the Washington Post and she assured me - and I don't know where she got her information from - that they definitely do. "But if I get an invitation to the Tower for a cup of tea, I don't think I'll go."